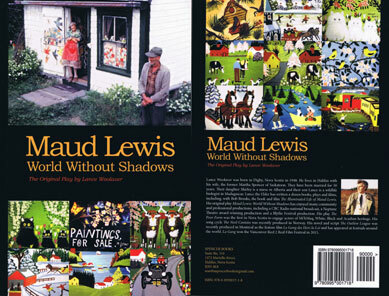 World Without Shadows MAUD LEWIS "World Without Shadows" is the..
MAUD LEWIS "World Without Shadows" is the original stage play written about the famous Nova Scotia, Canada folk artist. It was first broadcast as a radio play via CBC Radio to Nova Scotia, Newfoundland, New Brunswick and Nova Scotia, and then via a national Canadian CBC broadcast, in 1996. Subsequent productions have included King's Theatre of Annapolis Royal, Ship's Company Theatre of Parrsboro, Festival Antigonish, Neptune Theatre of Halifax, Nova Scotia and the Blythe Festival of Blythe, Ontario. Scenes from the play were included in the National Film Board of Canada feature documentary film "The Illuminated Life of Maud Lewis", as written by Lance Woolaver, and featured actors from the King's Theatre of Annapolis Royal production. The characters include Maud's husband of record, Everett Lewis, and Maud's good friends and neighbours of Digby County. All characters are taken from life. The Canadian actor, Niki Lipman, would describe the role of "Maud" as "the role of a lifetime." "World Without Shadows" is dedicated to Thornton Wilder, with whom the playwright visited in Connecticut in 1968. "World Without Shadows borrows its structure from "Our Town": it takes place in our time signatures, the perfect and imperfect past. Like "Our Town", "Shadows" is as much a play about a village as it is a play about lives. Characters are presented as both ghosts and living beings. As the characters come and go, Maud's bright paintings spark revelations of their lives. 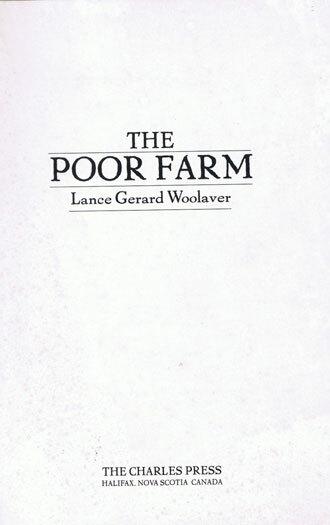 The Poor Farm is the second play in Lance Woolaver’s trilogy about Digby County, Nova Scotia. It was first produced in 1998 as a dramatic reading by The Chester Playhouse under the direction of Christopher Heide. The cast included the distinguished Canadian actors Walter Borden as Jinky and Jocelyn Cunningham as Baa. The full production followed in June of 1999 with Walter, Christopher and Jocelyn. The actor and playwright Josh MacDonald played the role of the escaping son, Harry Baby. The Poor Farm in Marshalltown was an old, wooden asylum next door to Maud and Everett Lewis, folk painters, and the Maud Lewis House. Maud and Everett were the subjects of the first in the Digby County Trilogy, Maud Lewis – World Without Shadows. Every county in Nova Scotia had a Poor Farm or a Poor House. These prisons for the poor were closed in Nova Scotia in the 1960’s. The first workshop of this play took place at the Banff Centre of the Arts, at the Banff Playwrights Colony, with the assistance of Bob White. The Poor Farm asylum, also know as the Alms House, in Marshalltown, Digby County, housed up to 200 inmates at a time. It burned down in 1995. If you are interested in preforming "World Without Shadows" for your community or school group please contact Lance at writerlancewoolaver@gmail.com. Lance will answer any question you have to help you put on a successful production.